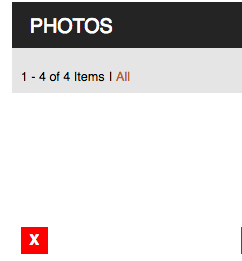 Why is my photo showing as a blank white box? If you see this, check the name of the file. Photos should only be named with letters, numbers and dashes. Make sure all special characters (% or & or @ or #) are removed. Once you have renamed the file, upload it again. For Example: a photo named "nicoles%bighunt&deer" would not upload correctly because of the % and & in the name. When I rename to "nicoles-big-hunt-deer" or even "nicolesbighuntdeer" it will load just fine. More information on how naming photos can work for you.